If you have a need for speed, check out this six-zip racing course that zigs and zags across the ridgeline of a mountain bowl. You’ll soar at dizzying heights of nearly 200 feet above the ground. 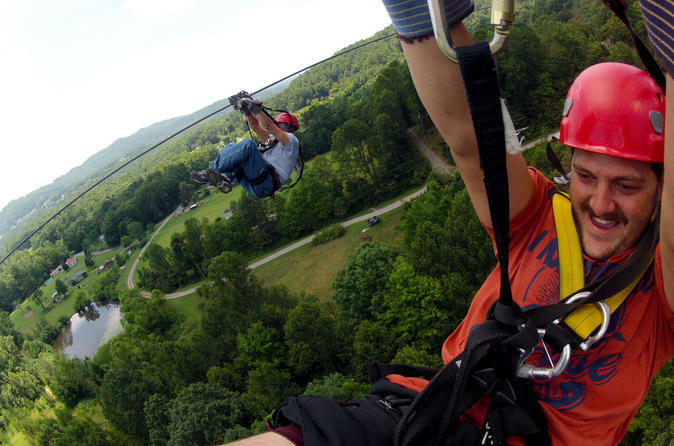 These zip lines range from 500 to 3,100 feet including one of the longest zip lines in the East! Tours include up to 20 guests with 3 certified guides. A weight restriction of 100 to 260 pounds applies. Meet your zip line guides at our departure location and you'll hop on the 10-minute shuttle to the home base. Once at the zip line location, you will gear up in the provided full-body harness, helmet and gloves. Your trip will walk to the practice zip where you will learn the skills needed for a successful day. These skills include zip positioning and line attainment. With guidance, each person will be required to demonstrate these skills in a low risk environment. After your training, the zip line tour begins with two shorter zips of 500 and 450 feet respectively. These are followed by 3 more zip lines between 1,400 and 1,800 feet. A short shuttle will bring you to the longest and final zip-Adrena-Line, a 3,100-foot behemoth where you are likely to reach speeds of 40+ mph. Another short shuttle ride with complimentary beverage returns you to the resort.